Very much like the Spin Turn in Waltz, the footwork is the same but the main difference in the Quickstep is your timing. 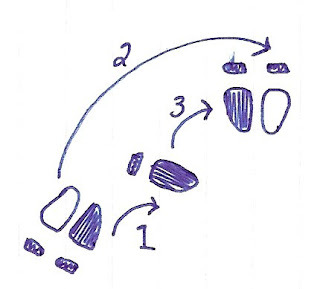 The total pattern for this step will be "Slow, Quick Quick, Slow, Slow, Slow" (whereas most of your other patters have been simply a repetition of "Slow, Quick, Quick). The rise and fall is slightly different as well, but I will talk about that in a later post. Remember that there is a varying amount of turn that you can do when you do a spin turn, depending on whether you are doing one in a corner or along a long line. 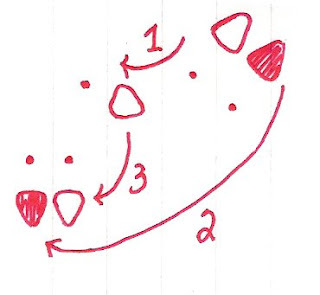 This set of diagrams shows the amount of turn in a corner and assumes that you are going to use the following step to turn to face diagonally to the new line of dance. 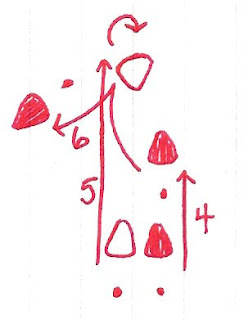 You can follow this with a Progressive Chasse which will keep you moving along the LOD and allow you to get back into your "basic" pattern of Quarter Turn to Right and Progressive Chasse. 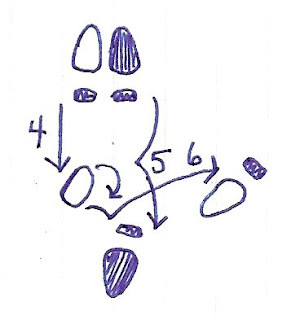 Step forward into your partner with your Right foot (Count Slow), beginning to curve to your Right, the next step is taken forward as your partner is pivoting, which means that you end up with your weight on your Left foot and your back to the diagonal you initially started on on a second SlowCount. (Which in the technique books is therefore labelled as a step back and slightly to the side.) With your weight on the toe of your Left foot, lightly brush your Right foot towards your left (Count "2-and") and then back out on a diagonal to step forward on another Slow Count. Following this step, you can go straight into a Progressive Chasse. - When doing the pivot, it is very important that the gentleman keeps his weight over his supporting foot at all times... if you start to lean forward or backwards, you make the turn impossible for your partner. This also goes for the women, however. Ladies, do not hold on to your partner for dear life or lean into him, this will make the turn heavy and difficult to turn - it should feel light and easy! !